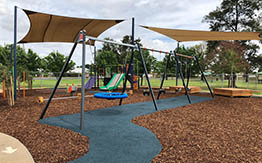 Elizabeth Park, located in East Dubbo off Windsor Parade, is a 10 hectare site in which Council is progressively developing the Dubbo Regional Botanic Garden. The botanic garden development commenced in 1999 and today comprises of four major gardens (Shoyoen (Japanese Garden)), the Sensory Garden, the Biodiversity Garden and the Oasis Valley, plus a number of recently planted avenues. Shoyoen is widely recognised as being one of the best examples of a “strolling, relaxing” Japanese garden in Australia and gardeners from Japan visit every year to help maintain the autheniticity of the garden and train Council staff in Japanese gardening techniques. The Biodiversity Garden provides visitors the opportunity to experience the Australian bush. This garden is planted with plants native to the Dubbo area and the plant name signage also provides the local (Wiradjuri) Aboriginal name and cultural uses of the plant. The Oasis Valley provides visitors the opportunity to see the developing “dry rainforest” whilst walking over a creekline via a board walk. The Sensory Garden gives visitors the opportunity to experience plants through the five senses, being sight, sound, touch, taste and smell. The development of Elizabeth Park and the Dubbo Regional Botanic Garden is guided through the Elizabeth Park Master Plan 2011. Regand Park is located on the eastern side of the Macquarie River and is accessible via a new walkway (between dawn and dusk only) from lower Macquarie Street (near the John Gilbert Water Plant) and lower Tamworth Street, and forms an integral link to the river corridor path and cycle way system. The new 2.5km riverside walk under the boughs of centuries old River Red Gums and provides beautiful vistas back along the Macquarie River. As you enjoy this walk are likely to see many local species of birds and animals that make this river corridor home. The Regand Park Master Plan will see the ultimate development of this 62 hectare site into a regional facility that will provide a range of recreational facilities and opportunities and improve the riverine corridor through extensive plantings of endemic riverine species. Victoria Park, located on Darling and Talbragar streets, has been at the heart of Dubbo's recreational pursuits from our earliest beginnings. The village of Dubbo was surveyed back in 1848 and the plan gazetted in November 1849 with 71 acres originally set aside. Over time parcels of land around the edge of the original park have been resumed by the Crown for civil infrastructure or education purposes, however, the heart of the park has remained. It was not until 1878 that Dubbo Council became trusteeship of the public open space and commenced formal management of the site. On the 10 December 1890 Victoria Park was formally dedicated for "public recreation". The area today comprises of 3 regional sporting ovals and the "The Park" itself. The park today is a cool and shady place ideal for family picnics and social gatherings. It has a regional quality playground (Livvi’s playground) that has disabled accesible, BBQs, toilets, skate park, garden displays etc. To help ensure that the park remains true to its original intent the Victoria Park Rehabilitation Master Plan was developed, and adopted in 2013. This plan will guide the future development and maintenance of the park and ensure that it will continue to deliver high quality recreational facilities and opportunities to the residents and visitors of Dubbo for generations to come. Wiradjuri Park is located on the western side of the Macquarie River, immediately north of the Seriser Bridge. The park is approximately 3.3 ha in area and is highly visible both from the Newell Highway and Thompson Street (connecting the Newell Highway with the Mitchell Highway). In response to the community a Master Plan was prepared and publicly exhibited to develop Wiradjuri Park into an Aboriginal cultural park. The development of this park will provide the local and broader Aboriginal community a place to gather, celebrate their culture, acknowledge significant dates on their calendar and remember loved ones who may have been lost from their community. For the broader community it will provide a space in which they gain a greater understanding and insight into Aboriginal Australia (from pre – European through “first contact” and through to the present day).